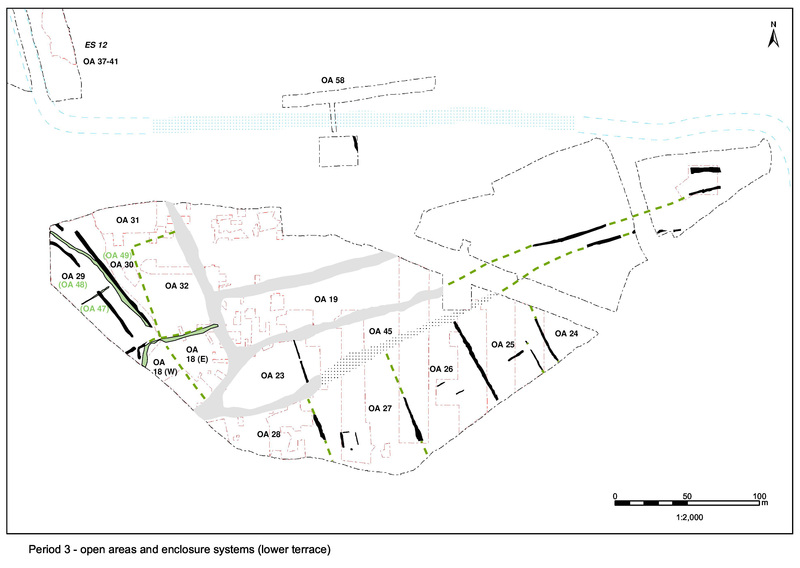 Albeit not extensively excavated across its southern extent, where investigated within Excavation Areas M and N, the rear of Open Area 27 appears to be largely devoid of early Roman features (Figure 95) - in clear contrast with preceding Period 2 (see Open Area 26 earlier and later as well as Open Area 25). Period 2B Building 36 and adjacent animal pen Structure 22 are cleared and it is perhaps likely that at least the rear half of this enclosure is now given over to gardens or even pasture. That this part of the enclosure is not occupied as such is further suggested by the presence of cremation burials. 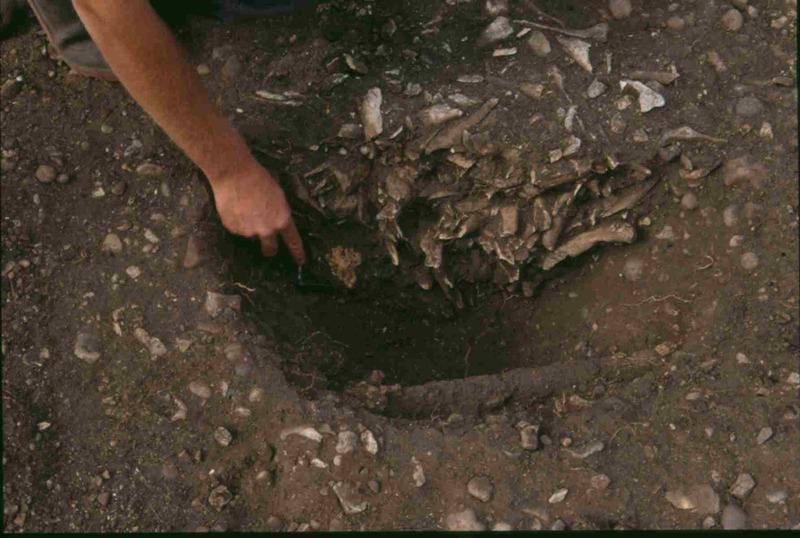 A hearth pit may mark the southern extent of occupation within the enclosure during this period. 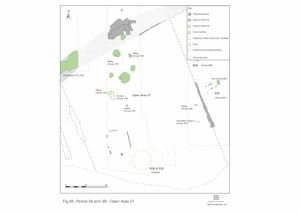 Following this theme of occupation activity being concentrated in the front of the enclosure, the presence of slight traces of a possible rectilinear building occupying its north-west corner is noted. While recorded during pre-excavation site planning, it would appear that the last vestiges of its foundation slots were not subsequently apparent and therefore went uninvestigated. Nevertheless, the building is described below and included in Period 3 - albeit somewhat arbitrarily. While some subdivision of the pits between sub-periods 3A and 3B can be attempted, the lack of chronological definition displayed by the limited number of other features present makes this fairly meaningless. Instead, broad Period 3 activity within OA27 is described collectively. Cremation burials 15017 and 15040 (Cremation Group 3) lie close together toward the eastern boundary of OA27, and toward its rear - seemingly isolated from other Period 3 remains within this enclosure. 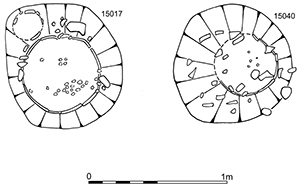 Each burial occupies a small circular cut of around 0.45m diameter and surviving depth of 0.2m (Figure 119). Burial 15017 comprises a black-surfaced ware jar that holds a small amount of cremated bone (750g, adult) in its fill, accompanied by a buff ware flagon and probably a lid (the greater part of which has been removed by truncation). Otherwise, the artefact assemblage from the backfill resembles an ordinary rubbish deposit that would not look out of place in any small pit of this period. Burial 15040 comprises another jar containing 600g of cremated remains, accompanied by a miniature necked-jar and dish. All vessels are of black-surfaced ware. It is possible that the platter is used as a lid. An early Roman date is suggested for these simple cremation burials; the backfill of grave 15040 includes samian ware dated AD 60-80. They are of interest as examples of 'informal' interments within occupation enclosures. As seen elsewhere, they occupy a peripheral location and, incidentally, suggest that although the Period 2B ditches may have passed out of use, the eastern boundary of OA27 is perpetuated in Period 3. Further discussion of peripheral burials is presented in Vol. 1, Chapter 7. This small elongated pit is situated towards the front of OA27, toward Road/track 3. Although the cut measures only 0.8m by 0.36m and 0.61m deep, its fills are exceptional for the volume of pottery that they contain: over 300 sherds including eleven complete or near-complete vessels and substantial parts of three more, with a minimum of nine other vessels represented by at least one sherd (fill 20009, KPG17). The ceramic assemblage is dated to c. AD70. Other than the pottery, there are only a few fragments of a lava quern, and a tiny amount of briquetage daub and bone. This is clearly an atypical assemblage for a Period 3 pit and it is inferred that this ceramic assemblage has been carefully selected and placed. Its positioning and date are not dissimilar to structured deposit 4148 in adjacent OA28. It is likely that this constitutes a structured deposit of some kind - perhaps representing a rite of termination. This is further discussed in Vol. 1, Chapter 6. 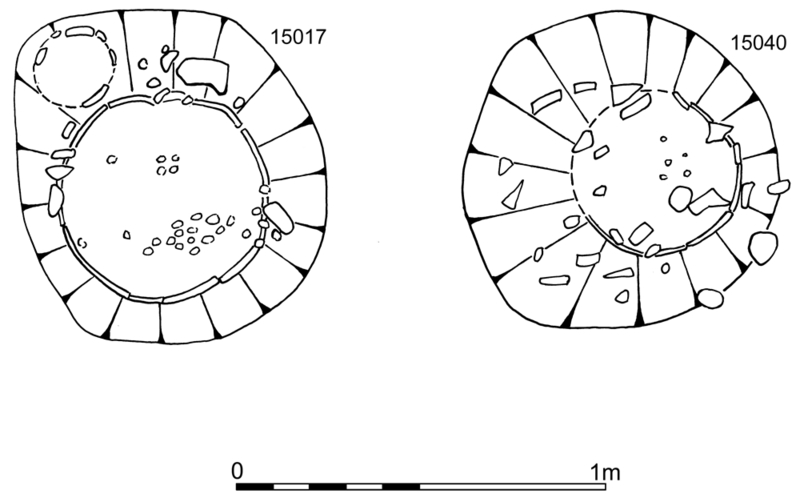 Hearth 14491 is a circular cut, 0.7m diameter and 0.27m deep (Figures 96 and 120), located toward the west side of OA27; perhaps positioned to the rear of an unexcavated building located toward the roadside. The gravel apparently lining its sides is heavily scorched, and slot-like feature 14511, protruding to the north-west, may be a small flue. Its silt fill, although containing charcoal flecks, does not reflect the heavily burnt nature of its sides. Since the fill of the feature below (14530) is not burnt, it may be inferred that this hearth pit has been cleaned out. Although probably not associated with its primary use, its infill is, however, notable for its high animal bone content (18kg) and for the presence of an iron bar or rod (SF7012), which lies across the top of the feature (context 14493). 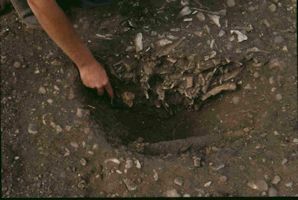 The bar is apparently set into the sides of the cut and held in place with lumps of clay, thus it may well be in situ; perhaps the remains of a grate. 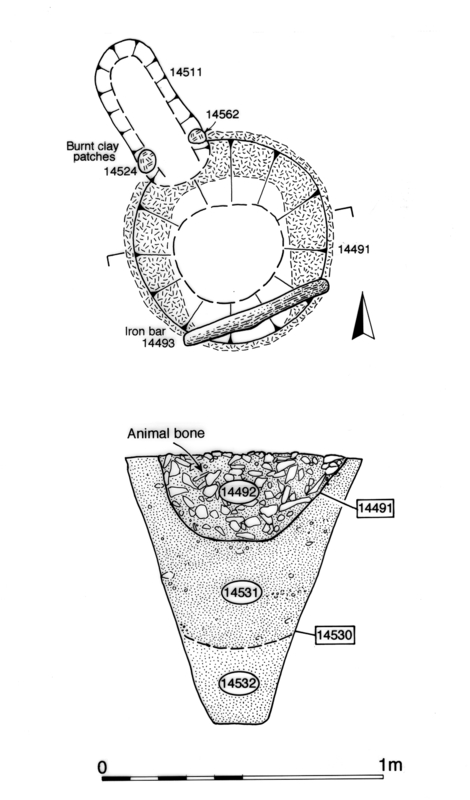 It is unlikely that the bone has anything to do with this structure's primary function and it is merely the result of its secondary infilling in the late 1st century. Although no superstructure survives above the pit or flue-like protrusion, their fills contain fragments of daub that could be derived from one. Although already described as an OA28 component, well 4536 is actually located in adjacent OA27. It lies slightly north-east (outside) of what is judged to be the unexcavated eastern boundary ditch of OA28, though it is unclear whether or not the boundary extends the whole depth of the plot; it is possible that it stops somewhat short of the Road 3 frontage. The well could therefore be deliberately positioned at this boundary position and been accessible as a water source for both enclosures. 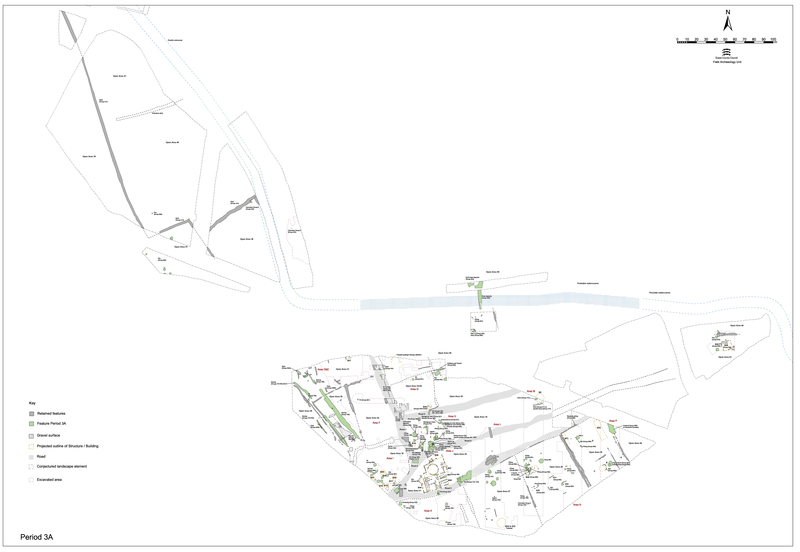 Virtually all of the early Roman pits encountered in the investigated parts of OA27 are located toward its northern frontage (Groups 704, 707), the rear of the plot (where excavated) being conspicuously clear. Generally oval to round and varying in size from 1.5m to 5.0m diameter, these are spread across the frontage, with some cases of inter-cutting apparent. They tend to contain large but restricted finds assemblages, composed mainly of pottery with small amounts of bone and daub. Metalwork content is low, with no sign of debris such as cast waste, slag or mould fragments. Modest quantities of tile and oyster shell are now present. 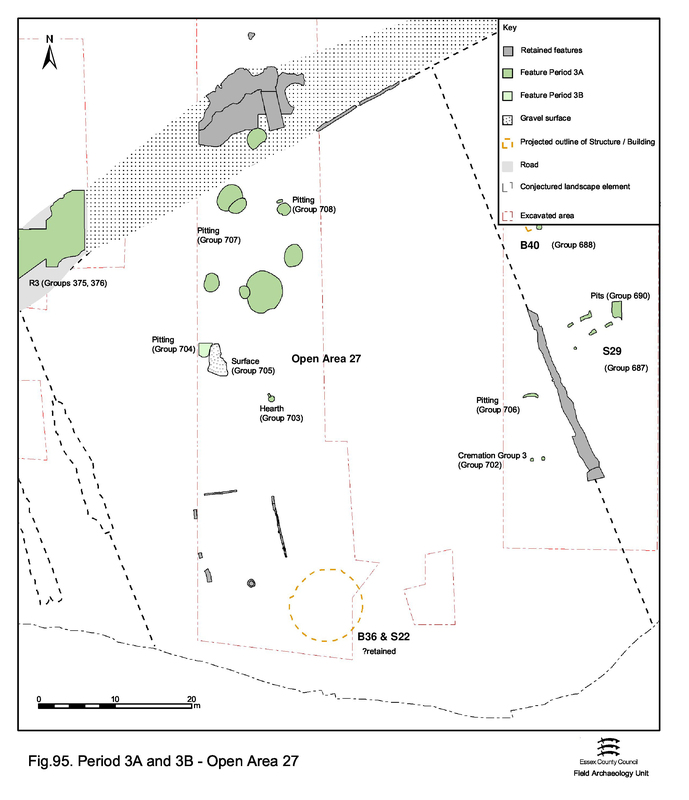 The lack of residual material, in striking contrast to contemporary pits in, for example Open Area 28, may simply be due to location; these pits do not cut into earlier features as often as those further west and thus do not disturb earlier finds-bearing deposits. Pits 14806, 20010, 20173, 20174 and 20187 (Group 707) are almost certainly filled by the end of the 1st century AD. Pits 14700 (Group 704) and 20012, 20024 and 20066 (Group 707) are unlikely to date to before the 2nd century and their filling may continue up to the mid-2nd century AD. 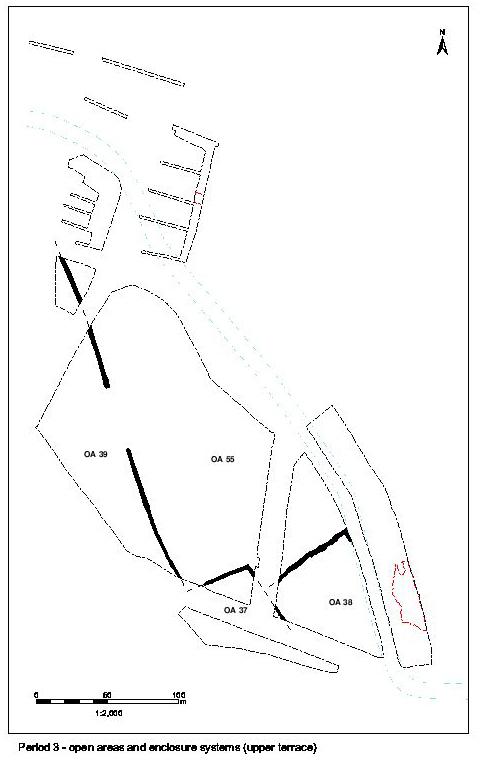 Pit 20187 (Group 707) is notable for its significant encroachment upon the line of Road/track 3. However, this may be seen as the final pit of the Period 2 inter-cut cluster at this location. Even so, it serves to indicate that that the thoroughfare is not particularly well maintained nor respected even at this short distance outside the settlement core. A pair of early Roman inter-cutting pits (Group 706) lie in apparent isolation on the eastern edge of Open Area 27. A 2m diameter pit 24188 is cut by more substantial pit 24115. Pit 24188 contains vestiges of the base of a possibly in situ clay structure and could conceivably be the cut of an early Roman oven or kiln that is in fact broadly contemporary with the partly infilled 24115, utilising it as its stoke-hole. Gravel layer 14693 (Group 705), which partly overlies the fills of pit 14700 (Group 704) may constitute a rough surface or alternatively be the upper fill of a more extensive pit cluster. It is likely to be earlier 2nd century in date. It is tempting to suggest that, if indeed a surface fragment, it belongs to the unexcavated building noted to occupy the north-west corner of the enclosure (see below) - being either an external or internal floor deposit. However, it contains no artefacts to help determine this. 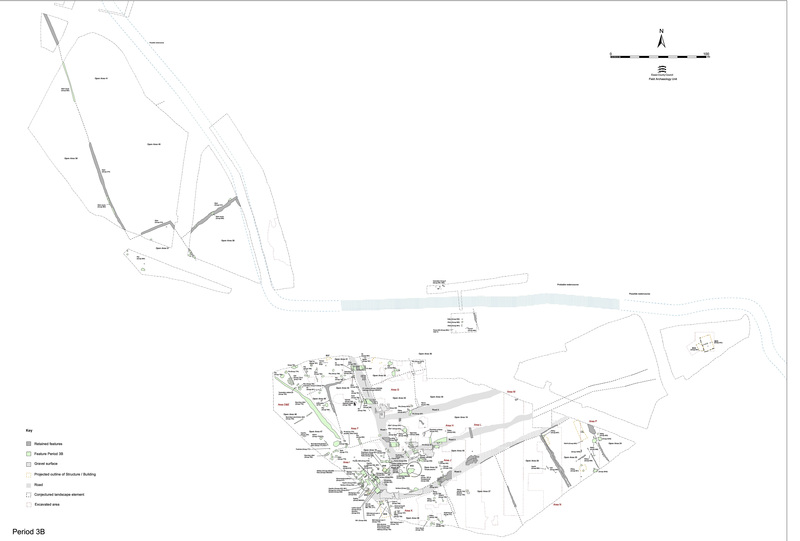 Located in the north-west corner, and aligned on the boundary between OAs 27 and 28 and on Road/track 3, a fragmentary but rectilinear arrangement of insubstantial slot-like features define a likely building. Measuring 11m wide east-west by at least 12m north-south, it contains further slots suggestive of internal partitions. Some of the Group 707 pits (see above) to its east could be contemporary, though others such as 14700, 14806 and 20066 cannot. No relationship with these was determined in the field. However, as pit 14806 contains a late 1st-century ceramic assemblage and 20066 and 14700 earlier 2nd-century material, it is perhaps difficult to see where this building fits in the Period 3 occupation of this enclosure. Perhaps occupying a similar roadside position to B39 in OA28, this structure is only slightly wider. The posited flue of hearth-pit 14491 points toward the building and could perhaps denote an associated cooking structure positioned just to its rear.